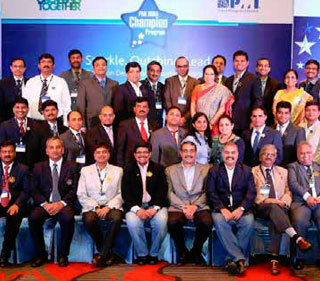 The PMI Champion booth at PM Day in Intel. On 28 May, PMI India Champion Rajakumar K.R., PMP, coordinated a Webex session on 'Advanced features of Microsoft Project 2013' for Wipro employees. The session was delivered by Champion Advisory Committee (CAC) member B. Sai Prasad, PMP, and was attended by around 90 members. The session was well received by the participants. 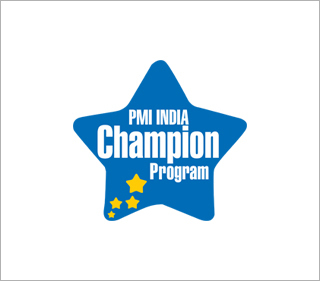 On 6 May, a Project Management Professional (PMP)® preparation program for aspiring project managers was organized by PMI India Champion Ramesh M., PMP, at Polaris Consulting & Services Ltd., Chennai. It was ably supported by internal PMP® credential holders & colleagues from the learning and development team. Over 50 aspiring project managers attended the session. 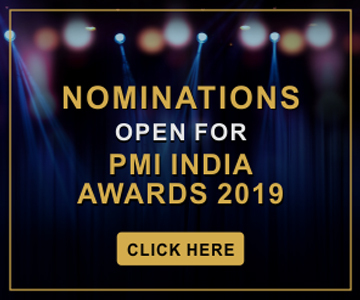 The entire program had been broken down into modules of 10 half-day sessions with each session designed to maintain focus and momentum of the aspirants in achieving the PMP credential. The sessions were conducted via video conferencing with participants from Chennai, Mumbai, Hyderabad, Gurgaon, and Pune. The participants gained practical understanding of project management processes prescribed in A Guide to the Project Management Body of Knowledge (PMBOK® Guide). 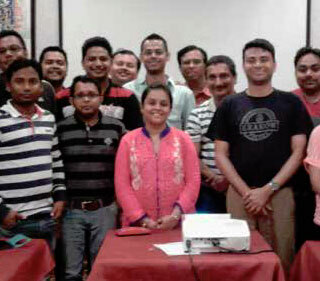 On 5 June, PMI India Champion Shweta Katre conducted a PMP overview session at Society of Defense Technologists (SODET), BEL Campus, Bangalore. SODET is a nonprofit organization and is maintained by 13 defense establishments. One of the objectives of SODET is to promote sharing of knowledge among the 13 defense establishments which are member organizations of SODET. The session was attended by around 50 participants and was focused on helping the participants understand the roadmap to clear PMP examination. 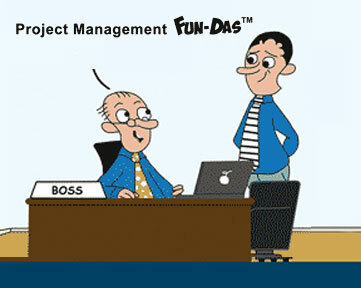 On 18 June, Intel India organized a Project Management (PM) Day at their Bangalore campus. More than 100 of their project managers attended the event and benefited in the form of learning and networking. The day started with a welcome address from PMI India Champion Designate Samuel Dorairaj, project manager and India business operations. The keynote address was given by Rahul Biswari, director-HRGS Centers, Hewlett-Packard. Jacob Varghese, head - IT, Defense and Aerospace Markets, PMI Organization Centre Private Ltd., talked about PMI best practices. Mr. Varghese called out the need for more collaboration. B. Krishnamurthy from IIL spoke about the need to be mindful as we discharge our duties every day. 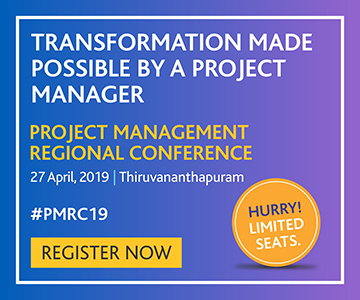 Udayakrishnan M.B., manager, Project Controls and Solutions Office (PCSO), APAC region and Intel India PMWG lead, talked about the PCSO team's integrated project management solutions can support business transformation. Giving a demo of an all-in-one desktop computer, John George, program manager, Reference Validation Platform team, CCG, Intel India, shared the story of business transformation in a start-up environment. Shidlingeshwar Khatakalle, senior staff engineer, ICDG, Intel India, spoke about attaining stability in a virtualized platform. The event venue also had a PMI Champion booth, where all PMI offerings were discussed and enrollment was taken for upcoming PMP credential training. PMI India Champions Hariprasad K.V., PMP; Abhijeet Palnitkar, PMP; Gowrishankar Chandrasekaran; and Mr. Dorairaj were active volunteers for the entire event and played a significant role in making it a memorable one. On 20 June, CAC member Visukumar Gopal, PMP, presented a session on 'Applying Lean in Projects - Best Fit or Force Fit?' at the Engineering and Construction Forum, Chennai. It was a knowledge sharing and networking session organized by PMI Chennai Chapter and held at the Indian Institute of Technology Madras campus. On 20 May, PMI India Champion Gaurav Jain, PMP, coordinated a session on project management at L&T MHPS Boiler Ltd., Faridabad campus. The session was organized in association with PMI India. Raj Kalady, MD, PMI India, and Dilip Chaudhuri, chief executive - EPC, L&T-MHPS, inaugurated the event, which saw a participation of 80 top management members. The aim of the session was to make the participants aware of the importance of project management in the infrastructure industry.